4 or 6 nuts, bolts, canvas, washers to attach your flexible solar panel to canvas/sunbrella. Customers have found that using our canvas bolt-on kit works well for mounting semi-flexible marine solar panels directly to their bimini, dodger, or any canvas or sunbrella. 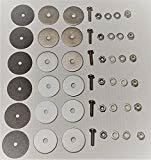 The kit includes a vinyl disk to be adhered to the underside of the canvas, fender washers to secure the bolt to the canvas, a bolt and nut to tighten the washers to the canvas and an acorn nut to secure the solar panel to the bolt. The kit includes 4 or 6 sets of attachment hardware depending on the solar panel. All metal components are stainless steel.